Don’t Buy Another Poster Until You Do This! There’s an old adage among all collectibles dealers, “don’t buy the “(insert any collectible here), before you buy the book! What this is saying is that Knowledge is King! In addition to owning a library of proper reference material, I would highly suggest that you immediately become a member of The Rock Poster Society, known as “TRPS”. Membership is just $30.00 and includes a T-Shirt, newsletter, access to member events and other goodies. In addition, TRPS serves to promote the hobby of rock concert poster collecting and is very supportive of the artists as well. 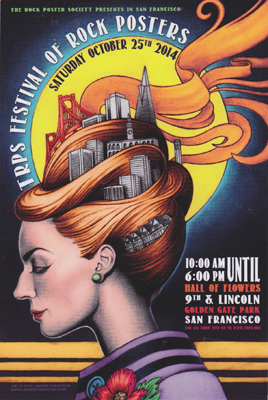 TRPS also holds the largest concert poster show in the U.S.A. each October, in San Francisco. Join today, and if you don’t think your membership is worth multiples of what you pay, let me know and we’ll pick up the tab! Be sure to tell the folks at TRPS that we sent you! To join The Rock Poster Society, click here! To see a list of the best reference books on concert poster collecting, click here!